I don't often give oil painting tips on how to choose a painting medium, much less on how to make your own. Which oil painting medium to use is a very personal choice. If you ask ten different artists, you will probably come up with ten different answers! Some oil painters never use any mediums. I was one of them for a long time. That has changed, however, as I have started to use more layers in my paintings, rather than taking the alla prima (direct painting) approach. I can now vouch for the importance of having the right medium. When you use a medium, it makes spreading the paints so much easier. You do not have to fight to drag stiff paint across the canvas and your oil paintings shine. If some of your oil paints are dried or have less oil content, then adding oil medium helps to even out the paint consistency. Otherwise your work will have some spots with a totally matte finish, while others are just too glossy. You can, of course, buy ready-made oil painting mediums on the market. I have tried several of them, but I have not found anything I like. The problem with them is that often they are too sticky and make the colors way too transparent for my taste. Sometimes they even alter the colors I mix on my palette. I remedy this problem by diluting the medium with a little solvent or mineral spirits. This thins the medium and reduces the stickiness. In addition, I restrain myself from overusing it. If you want to make your own, here are some simple-to-follow instructions. Later you can experiment by changing the ratios and adding or removing some ingredients. Buy a bottle of stand oil from the art supply store. This oil is made of very thick linseed oil. It looks almost like honey and has a similar consistency. I like its golden glow. Instead of stand oil, you can use another carrier oil like walnut oil, chestnut oil, poppy oil or linseed oil. These oils are thinner, and some artists use them straight from the bottle. I tried that, but I find that it takes a long time to dry. For example, one time I used chestnut oil for laying out the imprimatura (the undertoning) for a glazed piece. The layer took at least ONE MONTH to dry enough that I could start to paint. So unless you have a lot of time, the upshot is to use pure carrier oil only for the later stage of painting! You can also add turpentine and damar vanish (a type of varnish to seal and protect your finished painting) to your carrier oil. I suggest a ratio of one part turpentine, one part of damar varnish and one part carrier oil. Play around and see what you find most comfortable. There is really no magic or 'secret formula' that makes or breaks a painting. A bonus when you add damar varnish into your oil painting medium is that it also acts as a protective layer for your painting. 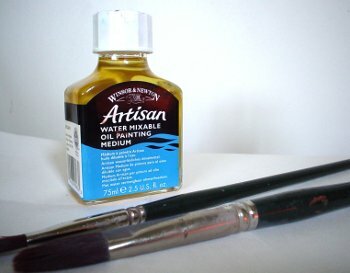 Overall, adding medium improves the properties of oil paints and makes it easier to maneuver them with your brushes. The drawback is that it can affect the colors. For example, linseed oil yellows over time. So you have to watch out for this, especially on the white and bright parts of your painting. Remember the rule of fat over lean? You want to build up pigment layers with increasing amounts of carrier oil. Start with turpentine or simply use the oil paints straight from the tube. As you add layers, add medium to your paints. Be careful though, because use of too much medium can cause uneven or prolonged drying times.